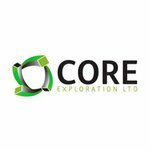 Hot on the heels of hitting high grade assays of silver and lead at its Blueys and Inkheart prospects in the Albarta region, Core Exploration (ASX:CXO) has turned to the north-east and is zooming in on copper targets in a highly prospective 20km zone. This 20km zone is right next door to a newly discovered resource – early indications of resource size point to 28kt copper and 18 million ounces silver. This mineralisation was drilled last year by KGL Resources Ltd in the Jervois Domain region of the Northern Territory – the same place CXO has snapped up land surrounding the discovery, and is now getting ready to drill into. An aerial electromagnetic survey recently was shot over CXO’s 20km long prospective zone right next door to KGL’s resource – and the first results are showing conductive targets all over. Initial processing is suggesting shallow targets for CXO – 100 to 300m, allowing cost effective RC drilling to be used. Could the upcoming drilling campaign lead to another copper resource, this time on CXO’s side of the fence? The big news for CXO right now is all to do with the Jervois Domain, the most northerly of CXO’s prospects in the NT. KGL have gone on to prove up the resource around this drill hit further, and they are currently modelling a 280kt copper and 18M oz. silver resource in a Pre-Feasibility Study here. But it’s not just the close proximity to KGL that we like about CXO’s land here. Recent Airborne Electromagnetic (AEM) data shows that across CXO’s 20km prospective zone has similar structural and magnetic features to the KGL discovery. 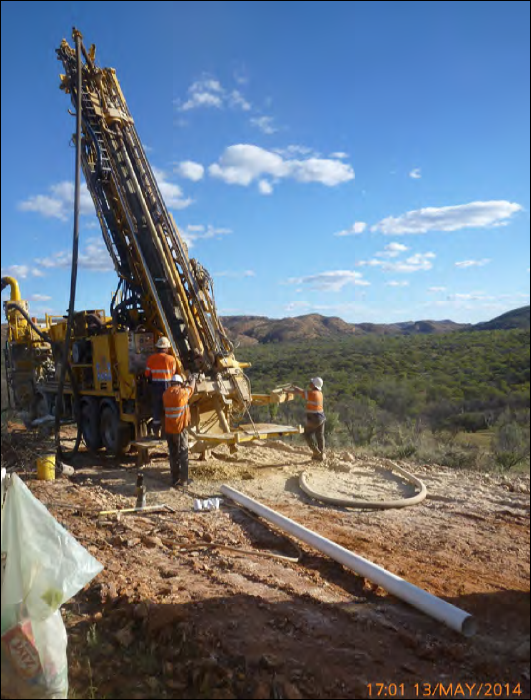 CXO should receive final AEM interpretation very soon, and following that, pinpoint drill targets will be identified – drill testing should be kicking off in March. How did CXO get to here? For the sake of brevity, allow us to summarise. Inkheart and Blueys have been the focus of drilling that was completed in 2014 and turned up high-grade assays of lead and silver. Stand outs included 3m at 198g/t silver with 4.1% lead, and 3m at 177 g/t silver and 4.1% lead. These assays were within broader intercepts of 6m at 96g/t silver with 2.1% lead, and 12m at 82g/t silver and 1.4% lead. This is the first evidence of large-scale alteration and mineralisation processes identified by CXO at Inkheart, and it hints at something of value lurking in the close vicinity. 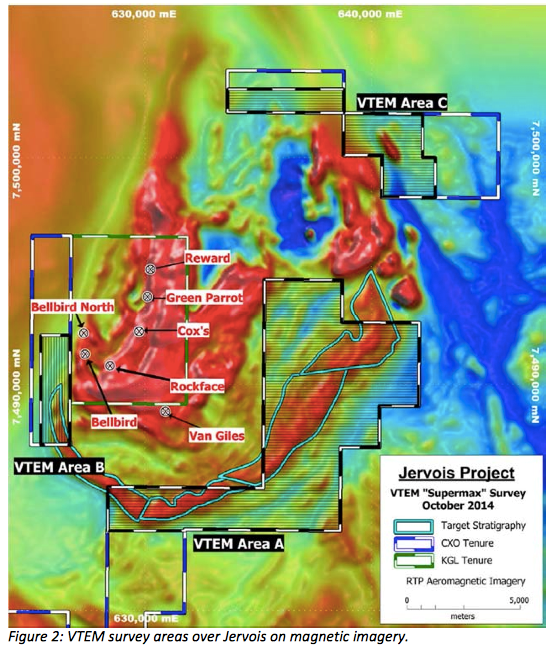 This sizeable something could be discovered by further exploration and drilling at Inkheart and Blueys is scheduled for early 2015 – likely after Jervois drilling takes place. CXO has also been drilling on the Virginia and Copper Royals prospects. At Virginia, it intersected elevated copper levels . 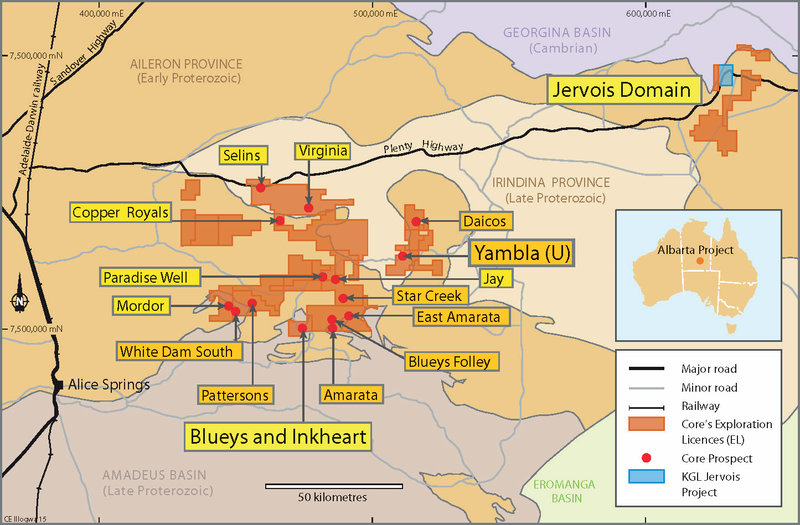 But as prospective as the wider Albarta Project is for CXO, all eyes are currently to the north east – on its 100% owned Jervois Domain project in the Northern Territory. 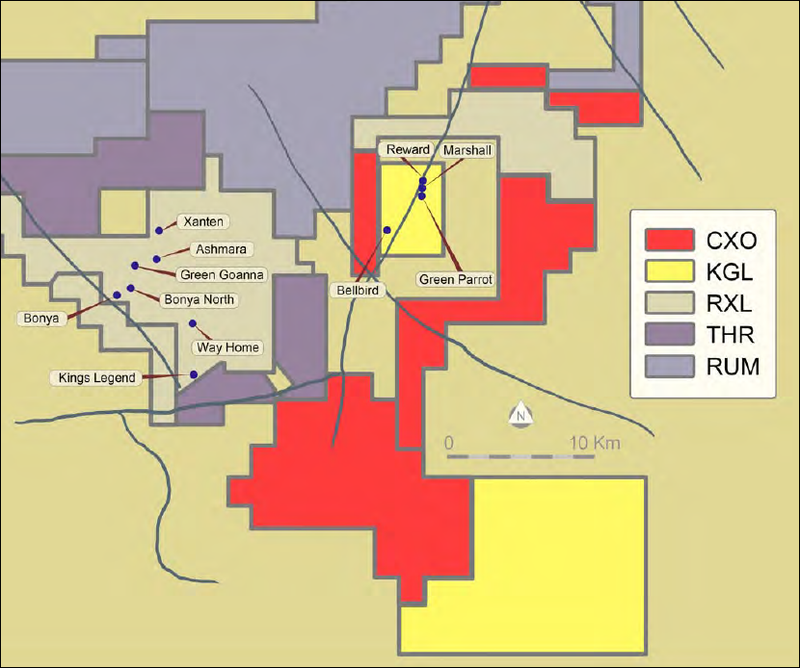 CXO tenements are marked in red in the map below – note how close the CXO prospective zone is to the KGL tenements, especially the Bellbird discovery – less than 500m! Back in October of 2014, CXO began an Airborne Electromagnetic Survey or AEM to define conductive drill targets for copper at Jervois Domain. The AEM survey focussed its power on a 20km long prospective zone with similar features to the one identified and confirmed by KGL right next door. The raw imagery from the AEM survey is reinforcing CXO’s geological model in the Jervois Domain and initial processing suggest target depths of between 100m and 300m – that makes for shallow drilling. CXO is now waiting for final processing and interpretation to be completed on its VTEM data by its own staff and the CSIRO, Australia’s national science agency. When that’s done we should see some drill targets, and then it’ll be into drilling mode! The prospective zone CXO is exploring is hosted within Bonya Schist geology – the same as the KGL discovery. Does it contain sedimentary exhalative deposits (SedEx) or Volcanogenic Massive Sulphide (VMS) deposits? These geological features typically occur in clusters and can hold concentrations of precious metals, including copper. If CXO finds its ground is rich with this, then it could unlock even more prospectivity in Jervois Domain. The long and the short of it is that most major copper and zinc mines including the world’s deepest copper mine, the Kidd mine in Canada, have either a VMS or Sedex deposit. And KGL’s tenement is thought to have a Sedex style deposit, though that is still to be confirmed. The only way for CXO to tell what it’s got down below is to drill – and that’s exactly what CXO is planning to do in in the next few months when it expects to have the final interpretation and modelling from the CSIRO. Then it will prioritise and refine drill targets and get stuck in – we could see CXO drilling in Jervois Domain in the next 2 months – and if its conductors turn out to be part of a larger VMS or Sedex system then we will be very pleased! At The Next Small Cap we are in count down mode for CXO – there’s lots of catalysts for the company ahead as it prepares to drill in Jervois Domain . The news flow should go something like this – CSIRO hands CXO the full analysis of its AEM survey, the confirmed conductors there will be used to define targets and then they’ll be drilled. All of this should start to happen in the coming weeks for CXO and the drill bits could start turning as early as March. 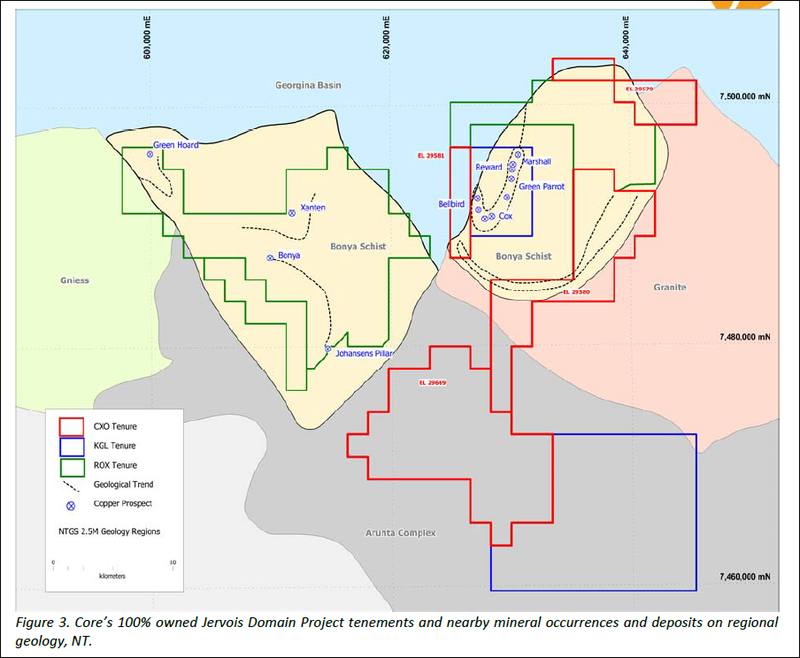 The Jervois Domain is CXO’s new frontier and as its development accelerates it will be added to an impressively long pipeline of projects including Blueys, Inkheart and Virginia, all of which are pressing ahead in 2015 further exploration on the cards.